Fund a Voucher Child: Fund Students, Not Schools! Support Children’s Right to Education of Choice! Under the Campaign you can fund two voucher projects - Delhi Voucher Project launched in 2007 and School Voucher for Girls in 2009. Delhi Voucher Project: In 2007, India's first voucher pilot, awarded vouchers worth up to Rs 3600 per year to 408 students in 68 wards of Delhi. 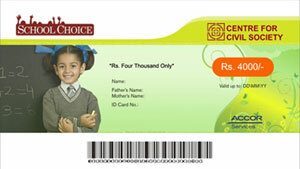 The vouchers were given for a minimum of 3 years. We received 1,20,000 applications! An assessment of the program demonstrated that voucher children have academically outperformed those still studying in government schools. More importantly for the future of these children, it indicated close to a 20% increase in the involvement of parents in their education after receiving vouchers. School Voucher for Girls: Given the success of the Delhi Voucher Project, this project was launched to fund the education expenses of 400 girl children from a poor minority community for four years. By targeting this traditionally disadvantaged group our project seeks to address gender-based discrimination in education through vouchers. Sponsor one or more vouchers and join our pioneering initiative to provide all children in India a Right to Education of Choice!